(English and Spanish Versions Available). 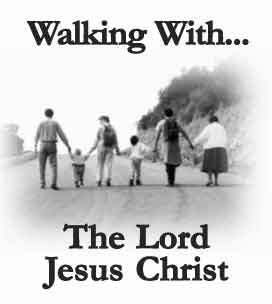 Walking with the Lord Jesus Christ is the follow-up discipleship pamphlet for use with the Our Spiritual Journey Together pamphlet. Once people have made a commitment to Christ, they need to know what steps come next to continue their journey with him. This pamphlet explains the steps, briefly. 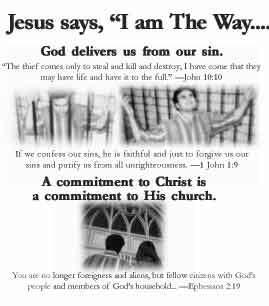 To view a video presentation of the Walking with Lord Jesus Christ pamphlet click here. Feel free to download, print, and distribute as many pamphlets as you like. Make sure you add your church’s contact information on the back of each pamphlet. We find the easiest way is to use the church’s mailing labels. To print the pamphlets on both sides of a sheet of paper, print a pamphlet on one side of a sheet, then flip the sheet upside-down and print it again on other side. Then you can run copies of it, cut it down the middle and fold it appropriately. If you intend to use a significant number of pamphlets, we recommend going through a professional printer, who can print large quantities, cut, fold, and bundle. 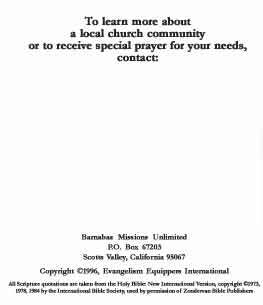 We at Barnabas Missions also like to print our pamphlets with blue ink for the Our Spiritual Journey Together and red ink for the Walking With the Lord Jesus Christ pamphlet. You can order copies of these from us as well if you like just email us at office@barnabasmissions.org. This is not a pamphlet you use with non-Christians or pre-Christians; it is used with people who have just made a commitment to Christ. Too often, Christians lead people to Christ but don’t take the necessary steps to get them started or grounded in their new relationship with him. It’s imperative that new Christians become grounded before the devil takes away the word that was sown in them (Mk 4:15 NIV). Use this pamphlet right after the person has accepted Christ (in accordance with the pamphlet Our Spiritual Journey Together or along with the Discipleship Follow-Up Questionnaire). The first panel, or the front, depicts a family walking together on a road. This represents the church—the family that believers become a part of once God adopts us as his children—and the journey that we’re all on as we become closer to God through Christ. It is also not something we do alone, rather it involves being a part of a wholesome community of believers of like faith who can strengthen us and support us in our walk with the Lord. 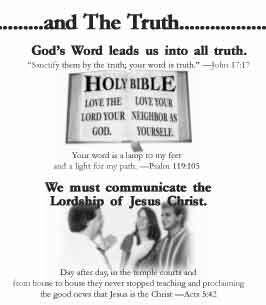 The inside of the pamphlet deals with truths that have to do with Jesus’s statement, I am the way, the truth, and the life (Jn. 14:6 KJV). The second panel shows us two truths that have to do with Jesus as the way. God delivers us from our sin. The images depict a man in prison, and the man set free. The Scripture is from Jesus’s statement in John 10:10: “The thief comes only to steal and kill and destroy; I have come that they may have life and have it to the full” (NIV). Explain that Jesus brings us victory over the sins in our life. The key to this complete victory is confessing our sins, or agreeing with what God says about them, and subsequently receiving his forgiveness and righteousness. Thus, the Scripture in 1 Jn. 1:9 eternal life says, “If we confess our sins, he if faithful and just to forgive us our sins and cleanse us from all unrighteousness” (NIV). A commitment to Christ is a commitment to his church. The Scripture is Ephesians 2:19: “You are no longer foreigners and aliens, but fellow citizens with God’s people and members of God’s household” (NIV). Explain that when we become Christians, he gives us the right to become children of God (Jn. 1:12 NIV) We become part of God’s family, and they’re here to support and encourage us in our journey with Christ. We don’t need to go it alone any more. The third panel shows us two truths that have to do with Jesus as the truth. God’s word leads us into all truth. The image depicts a Bible, with the two commandments that Jesus said were greatest: Love the Lord your God (Ex 3:6, Mt 22:37) and love your neighbor as yourself. (Dt 6:5, Mt 22:39) The Scriptures are John 17:17: “Sanctify them by the truth; your word is truth” (NIV), and Psalm 119:105, “Your word is a lamp to my feet and a light for my path” (NIV). Explain that we need to read the Bible regularly so that we can become familiar with who God is, what God says, and what God expects of his people. We have to compare everything we teach to the Bible, because the Bible is the most accurate description of God that we have. It is truth. Furthermore, the Scripture promises that as we move forward faithfully in following his word he will provide us a clear direction or illumination for our journey. We must communicate the lordship of Jesus Christ. The image shows Christians sharing their faith with others. The Scripture is Acts 5:42: “Day after day, in the temple courts and from house to house they never stopped teaching and proclaiming the good news that Jesus is the Christ” (NIV). Explain the background behind this verse. Jesus told his disciples (or students) to go everywhere and teach everyone what he had taught them (Mt. 28:20). So they did, and people were beginning to experience the life to the full that Jesus had come to give us (Jn. 10:10). We see that their witness, telling others about Jesus, was a regular routine thing they did— in the public marketplace of their day, and in the privacy of their homes. The fourth panel shows us two truths that have to do with Jesus as the life. Regular prayer is essential to our relationship with God. The image shows two Christians praying together (not something easy to do when you aren’t regularly attending a church!) with the two Scriptures: Hebrews 10:19: “We have confidence to enter the Most Holy Place by the blood of Jesus” (NIV)., and Luke 9:23: “If anyone would come after me, he must deny himself and take up his cross daily and follow me” (NIV). Explain that in ancient times, the only people who could stand before God were the priests, because they had gone through all the rituals necessary to make themselves holy for God. But now that God has made us holy, any Christian can now stand before God and ask him for anything and “we have this confident assurance before him, that if we ask anything according to his will he hears us, and if he hears us he will give us that which we ask of him” (1 Jn. 5:14-15). Explain that those of us who follow Jesus must be obedient to his commands, deny ourselves and take up our cross daily or on a routine basis. Prayer means setting aside your time and spending it with God. Together with reading the Bible, it’s how we get to know God. We can’t say he is our Lord and Savior but never spend any time with him. Remind the person that God’s plan was to have a relationship with his people, and that Jesus restored this relationship. In the End, after he returns, Jesus will raise his people from the dead, and he will actually live on the earth with his people. God says himself … “The dwelling of God is with men, and he will live with them. They will be his people, and God himself will be with them and be their God. He will wipe every tear from their eyes. There will be no more death or mourning or crying or pain, for the old order of things has passed away” (Rev. 21:3-4, NIV). God will deliver us from sin and temptation. Every Christian should be part of a local church community. The Bible will guide us into all truth. 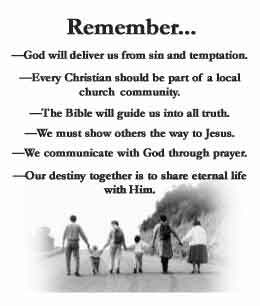 We must show others the way to Jesus. We communicate with God through prayer. 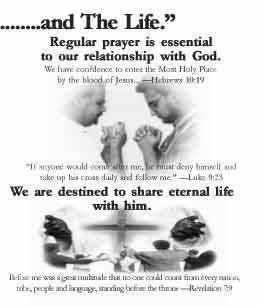 Our destiny together is to share eternal life with him. The sixth panel, or the back, is a place where you put your church’s contact information, or your phone number or email—so the new Christian can continue fellowship with the body of Christ. It is recommended all discipleship follow-up be done males with males, females with females, preferably of similar age, etc. When you are done with this pamphlet—ask them if they have a Bible. If they don’t have one, go to the church and get one to give to them. A church without Bibles for new and maturing believers, is like a truck driver without a truck, a writer without a pen, a teacher without pupils- you get the point! At this point you will need to get an appointment for another meeting with them if at all possible to begin a one-to-one discipleship process, or to help them become a part of a new believer’s class at your church, and/or a small group that would encourage their development in Christ. For more materials to help with this see the “Resources” page on our website and specifically the upcoming “Spirit-led Discipleship” curriculum we over there. For a video introduction to the Religious Attitudes Questionnaire and using booklets for sharing your faith see Part 12, Intentional Outreach Approaches of the Sharing Your Spiritual Journey with Others seminar. This session includes a thorough introduction into this approach in intentional evangelism efforts. For a comprehensive video/flash file seminar go to Be His Witness, Part 1: Using Questionnaires and Booklets to Share the Gospel & Train Evangelists, a video seminar that specifically shows you how to use the Religious Attitudes Questionnaire and our other pamphlets for outreach. Barnabas Missions makes a number of resources available free for use in downloading to further your evangelism, assessment, and outreach efforts. But the gospel while freeing- “the one who the Son sets free is free indeed” (Jn. 8:36) spreading the gospel always costs something either in time, effort, finances, prayer, etc. If you would like to support our efforts at Barnabas Missions, we covet your prayers. We also want to pray for you or other’s needs. Please send prayer requests to office@barnabasmissions.org. If you would like to support us financially through either a one-time donation or on a regularly monthly basis just click on the Donation button below and you will be directed to PayPal to make the contribution. All contributions to Barnabas Missions are tax-deductible as a 501(c)3 non-profit religious organization.